The Germans immigrants who settled in Pennsylvania in the 17th century found the soil made to order. Their fertilization, crop rotation techniques and general farming know-how resulted in the family garden yielding a rich bountiful harvest. And… as always, they made everything that was needed in their everyday life…beautiful. A trip to Amish country would show a well maintained family garden, close to the home for easy access from the kitchen and flourishing with vegetables, herbs and flowers. 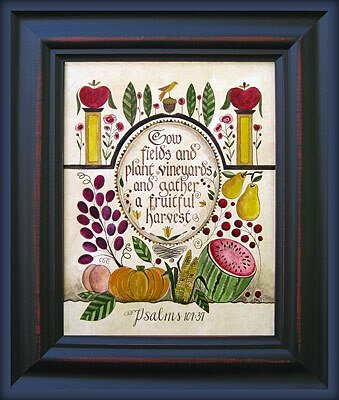 This one-of-a-kind ink and watercolor fraktur gives tribute to the harvest with a biblical verse from Psalms. Framed under UV glass, in a hand-rubbed black over red solid wood frame.